Ekka Yachts has sold and delivered a brand new 28.22 metre motor yacht. 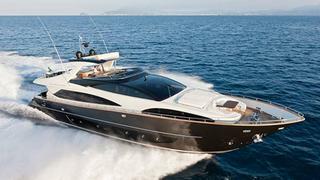 Built in GRP by Italian yard Riva, she is the ninth unit of the 92’ Duchessa model series. Accommodation is for eight guests in four cabins The master suite is located at the bow and is separated from the engine room by a spacious full-beam bathroom located behind the bed. The VIP suite is nearly as large as the master and there are a further two twin cabins, all with full en suite facilities. A noteworthy feature on this series is that the garage can host a tender up to 3.2 meters in length and a jet-ski. Alternatively, thanks to its lowered position, the garage can be fitted with a sliding chaise longue, thus creating an additional relaxation area just above the sea surface. Outdoor living areas are very comfortable and include the flybridge, with a full-size bar and a big, eight-seat dining table, the cockpit, which is completely shaded by the overhead, and the foredeck, which has a private table and seating area protected by its own Bimini top. Twin 2,435hp MTU engines power her to a cruising speed of 27 knots.